Review: "Napalm Death: The Code is Red...Long Live the Code" - Sea of Tranquility - The Web Destination for Progressive Music! These guys have been around so long you would have thought that they perhaps had run out of ideas by now. 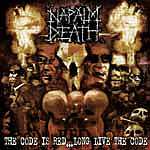 Not so, as The Code is Red...Long Live the Code is chock full of blistering and extreme metal, as only the brutal Napalm Death know how to produce. In addition to bone crushing grindcore, the band also pulls some tricks out of their doom hat as well, serving up some bruising Black Sabbath/Danzig styled riff-o-rama that works real well on songs like "Silence is Deafening", the churning "Climate Controllers", or the dirgy death metal of "All Hail the Grey Dawn". For the most part, you get speedy and complex thrash riffs, barking vocals, and furious rhythms, all Napalm Death trademarks, done here with precision and maximum aggression. If you like to live your life on the brutal and dangerous side, Napalm Death's 2005 release will find a welcome place in your CD player. Just tell the neighbors to leave town for a while.